You notice you don’t see too many nuns driving Dodge Hellcats? Why might that be? Today’s Nice Price or Crack Pipe Hellcat might be your chance to be un-nunly. That is, if its price and lien aren’t cause for alarm. I was saddened to hear of the passing of Verne Troyer late last month. With a career as an actor, stunt double and comedian, Troyer was a Little Person who it seems took a big bite out of life. He also looked like he would be a fun guy to hang out with. Last Friday’s 2014 Ford Fiesta ST was another example that size shouldn’t be considered inversely related to fun. Add a set of killer thrones in the cabin and that hot hatch’s $12,900 price started to look both small in size and big in value. That was reflected in the vote, where the ST managed a dominating 69-percent Nice Price win to wrap up the week. Let’s say however, that you’re not interested in small miracles. What if your mantra is not moderation in all things? What if instead it’s go big or go home? What would be your ride of choice—the biggest bang for your buck as it were—if you felt that too much can never be enough? How about this 2015 Dodge Challenger SRT Hellcat? I mean, you just don’t get much more batshitcrazypants than the 707-horsepower supercharged 6.2-litre Hemi V8 that lies under the Hellcat’s be-scooped and vented hood. 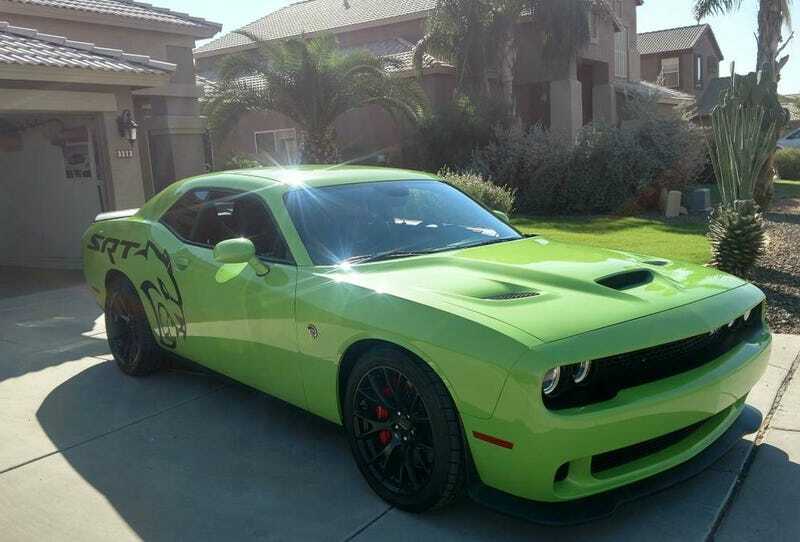 I think that we’re all pretty well versed on just what makes up a Hellcat so let’s get right into this particular Sublime Green over black suede monster machine. The seller says the car rocks just 22,000 miles on the clock, and is all stock save for the brash snarling cat and SRT decals on each Kardashian-esque haunch. He notes that those can be removed if you’re of the mind to do so. I guess all it would take is a hair drier and a couple of beers on a Saturday afternoon. Why do that however, when you could be spending that time converting hydrocarbons into tire smoke and laughing maniacally at the irony of doing donuts in the Krispy Kreme parking lot? This Hellcat looks to be locked and loaded to do just that. So, what’s new pussycat? Well, the ad notes that the tires and clutch are fresh. That’s at 22K, by the way. Yes, the SRT Hellcat is in no way parsimonious in its appetites. Other than that, it seems to be just as it was when it left the factory, fully loaded and ready to make OPEC members cry sweet tears of joy. The seller says the reason for the sale is due to a lack of use. He claims to have only added 1,000 miles in the past two years, which if my calculations are correct, is about 111 gallons of gas over that same time frame. Meh, we all get bored with our toys eventually. This toy comes with another issue of note aside from its extremely rapacious nature. That’s in the form of a lien on the title from a local credit union. The seller claims that will be paid off and the title delivered to a new buyer within 24 hours of a deal going down. How much would it cost to go down in this Hellcat? The asking price is $44,000, and the seller claims that to make this the cheapest one in the country. I’ve checked, and, aside from scams and salvage title cars, he may just be right. The question is, could he also be swinging a sweet deal here? The ad notes that two previous offers fell through, which leads one to believe something’s fishy either with the audience for these cars, or the deal itself. What do you think, could this car be worth that sort of cash? Or, is $44,000 just too much to go to Hellcat and back? At $12,900, Could This 2014 Ford Fiesta ST Be The Red Rocket In Your Pocket?